But new taxonomic proposals, fueled by biochemical and mtDNA research, may change this system (see below). Rattlesnakes seemingly appear when you least expect them. Take the hikers on this high Sierran trail (right). 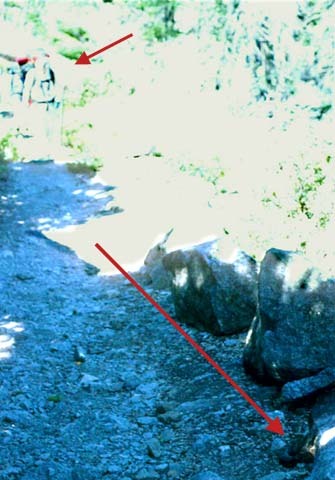 The last thing they are worried about up here at nearly 7000' elevation is a rattler in the trail, but there was a small Western Rattlesnake curled up right next to the main route (red arrow; close-up below). Over the years I've almost stepped on a half-dozen Western Rattlesnakes while hiking in Monterey County or in the Sierra; it always gives one an exceedingly strong jolt of adrenaline! As in any complex group of snakes, it is likely that further research may yield further, different perspectives on the species limits within the C. viridis complex. I have read the Pook et al. (2000) paper [available on line in pdf format] and find it fascinating stuff. They were able to reconstruct a phylogeny from mtDNA and, using a presumed mtDNA clock that has good concordance with known physiogeographic events (e.g., rise of the Andes; rise of the Sierra Nevada) can somewhat trace the history of these rattlesnakes from the Miocene. 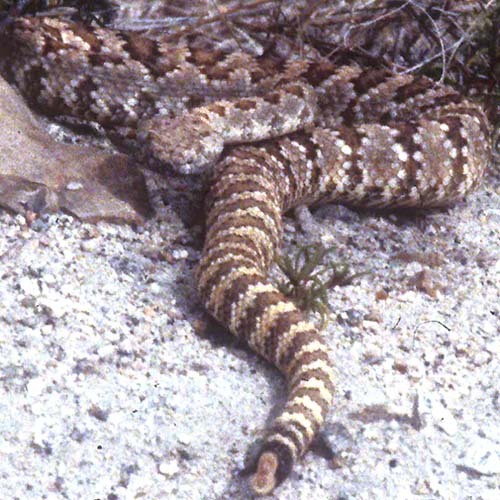 It seems that the trait of dwarfism arose independently twice, in C. v. nuntius ("Hopi Rattlesnake") and in C. concolor (Midget Faded Rattlesnake); the latter population also independently developed a Mohave-like highly lethal toxin. Certainly geologic events, like the formation of Grand Canyon, separated populations and led to developing species. However, unlike the more recent work by Douglas et al. (2002), they stopped short of going overboard on taxonomy and recommended that Western by split into three species: Prairie C. viridis; Arizona Black C. cerberus; and Western (the rest). Even though they stopped short of splitting the rattlers into 7 species, it is clear to me that there were influenced by the phylogenetic species concept (PSC) that has plagued bird taxonomy (e.g., they quote Cracraft, a primary proponent of this species concept in birds, liberally). I strongly suspect that the Douglas et al. (2002) work is grounded in the phylogenetic species concept. If that is true, I would hope that the more restrained "evolutionary species concept" on which Pook et al. (2000) rely better expresses the mainstream thought. although I fear it is a clone of the PSC. In any event, there is a lot going on with rattlesnake taxonomy! I mentioned the problems I have had in the past trying to identify rattlesnakes in California. 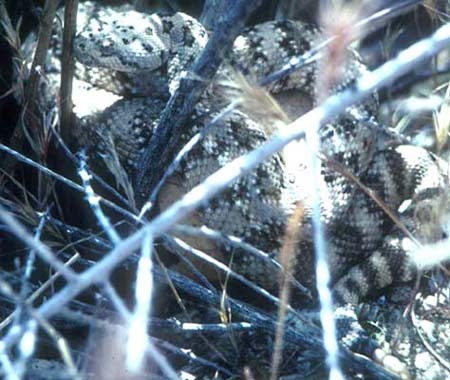 Because the colors of rattlesnakes can be so variably, depending on their habitat, Stebbins (1966, 1985, 2003) emphasizes scalation patterns that are damned near impossible to see in live snakes in the field, and hard to work with even in less-than-crystal-clear photos (i.e., in other words, my photos). Under I started putting together this page, and John Sullivan gently put me straight, I had misidentified and mislabeled the snakes shown above and right. They are, in fact, both different races of Speckled Rattlesnake C. mitchellii [as is the headline species at top of the page, also misidentified in the field]. Above is the beautiful Panamint Rattlesnake C. m. stephensi [photo May 1988 Willow Wash, Inyo Co.]; to the right is the much paler and less patterned Southwestern Speckled Rattlesnake C. m. pyrrhus [photo May 1985 Morongo Valley, San Bernardino Co.]. One rattler that I have found easy to identify in southeastern California is Western Diamondback Rattlesnake [right and below, photos May 1998 near north end Salton Sea, Riverside Co.]. 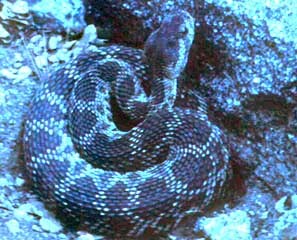 Its a BIG, thick-bodied, broad-headed rattler with conspicuous black-and-white rings before the rattle. I've read some surveys (e.g., Klauber 1972) that found the species to the the commonest snake (not just rattlesnake!) is some parts of southern Arizona (e.g., Organ Pipe Cactus NM). It is said to be an aggressive snake but, despite the look of the photo to the right, I've always kept a fair distance! I have yet to see Red Diamondback or Mojave Rattlesnake in the state; it is interesting that Mojave is the rattler that has developed venom that is drop-for-drop some ten times more potent that ordinary rattlesnake venom. These and a wide host of interesting facts about rattlesnakes are found in the classic awork by Klauber (1972; this is the popularized, abridged version of his earlier multi-volume books). In researching this page, I also found the summaries and great photos in Mattison (1996) to be very helpful. That book not only has color photos of all U.S. species, but all the Neotropical species as well. 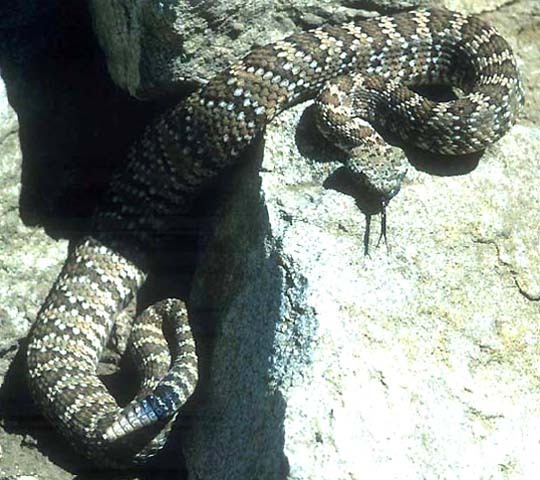 There are many on-line resources for rattlesnakes, but the "California herps" web site has photos of all of them in this State, with links to much additional information. More nice photos are on John Sullivan's "Wild Herps" web site. Ashton, K.G. & A. de Queiroz. 2001. Molecular Systematics of the western rattlesnake, Crotalus viridis (Viperidae), with comments on the utility of the D-Loop in phylogenetic studies of snakes. Molecular Phylogenetics & Evolution 21:176-189. Douglas, M. E., M.R. Douglas, G.W. Schuett, L.W. Porras & A.T. Holycross. 2002. Phylogeography of the western rattlesnake (Crotalus viridis) complex, with emphasis on the Colorado Plateau, pp. 11-50 in G.W. Schuett, M. Höggren, M. E. Douglas and H. W. Greene (eds. ), Biology of the Vipers. Eagle Mountain Publ., Eagle Mountain, UT. Klauber, L.M. 1972. Rattlesnakes: Their Habits, Life Histories, and Influence on Mankind. Abridged ed. by K.H. McClung. Univ. of Calif. Press, Berkeley. Publ. for Zoological Soc., San Diego. Mattison, C. 1996. Rattler! A Natural History of Rattlesnakes. Blandford, London. Pook, C.E., W. Wüster & R.S. Thorpe. 2000. 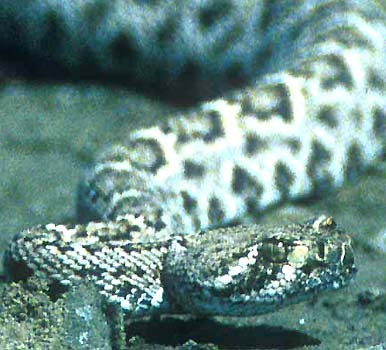 Historical biogeography of the western rattlesnake (Serpentes: Viperidae: Crotalus viridis), inferred from mitochondrial DNA sequence information. Molecular Phylogenetics & Evolution 15: 269-282. PHOTOS: All photos © 2003 Don Roberson, all rights reserved. Specific details are in the main text above.